Excerpt from Fred Harvey Farm newspaper story. The following is excerpted from Mike Hurley's book, "Newton, Kansas: #1 Santa Fe Rail Hub, 1871-1971." The book is being reprinted. In about 1905, Fred Harvey moved his facilities from Kansas City, Mo., to Newton and established an area on the east bank of Sand Creek, south of First Street, which was known as the Fred Harvey Farm. Two of the buildings are still standing in 1984. Of those two buildings, the north building was built in 1918. It is three stories high and housed the produce and carbonating plants. The first floor was used exclusively for the killing of poultry, and the only entrance to this floor was on the west side of the building. The entrance to the second floor was on the east side of the building on Rail Mill Road. The second floor was comprised of two sections, the north side and the south side. The north side contained the poultry office and the area where the poultry was dressed. After dressing, the poultry was then chilled before packing. The south side of the second floor contained the carbonating plant office and the bottling plant for the Fred Harvey brand of cola, rootbeer, club soda, ginger ale and fruit-flavored soft drinks such as strawberry, orange and lemon which were made from pure fruit juices rather than with imitation flavorings. The cola was actually bottled in Coca-Cola bottles under a franchise issued by Coca-Cola in about 1914. This is one of the few instances in which the Coca-Cola Co. allowed another concern to bottle its product. Coca-Cola ran lab tests at the Fred Harvey plant every six months to make certain that Coca-Cola standards were being maintained. The soft drinks manufactured and bottled here were sold exclusively at The Fred Harvey dining facilities, newsstands and aboard the trains by the Santa Fe agents known as newsbutches. A cooking extract was also manufactured under the Fred Harvey label. The third floor was equipped with windows and was used for the storage of live poultry crates. The windows were necessary for the circulation of air in and around the poultry during warm weather. The south building was built in 1926 with a drive-up inclined ramp on the north side leading to the second floor. This building served as the dairy. Milk, cream, butter, ice cream, cottage cheese and cultured buttermilk were processed and packaged there and then thousands of bottles of shipped to the various Fred Harvey facilities and dining cars. For a while, Fred Harvey maintained its own herd of 100 dairy cows. The herd was disbanded around 1925 and from that time forward the milk used in Fred Harvey products was purchased from farmers in the Newton area. Each Fred Harvey eating house made its own ice cream until 1927 when the ice cream plant began operations at the dairy and supplied all of the eating houses and dining cars in the territory served by the Newton facility. Because of the large volume of traveling public, employees and the local population in Kansas City, a dairy plant was established in the Union Station there in 1914 which furnished dairy products to the Fred Harvey dining room, lunch room, the employees' lunch room in the basement and the banquet rooms on the upper level of that facility. Between the north and south buildings mentioned above, in a now vacant area, once stood a warehouse used for the storage of empty Fred Harvey containers such as crates for dressed chickens and turkeys, pop cases, egg cases, milk and cream cans, and ice cream packers. 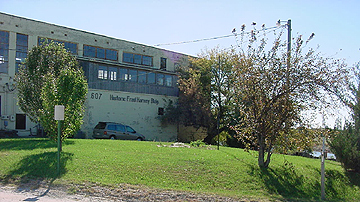 The west end of this building housed a refrigeration plant with an evaporation tower. The peak year for the Fred Harvey operation was 1918 when 54 lunch rooms, 37 dining rooms and 26 hotels were operated between Chicago, California and Texas. At this time, 16 buildings stood on the Fred Harvey Farm. On the east side of Sand Creek, the buildings ran from east to west as follows: a feed house, a cooker, a brooder house, an incubator house with a large enclosure on the north side, an office building, a 16 foot by 68 foot potato cellar for storage which was located on the present site of the north building mentioned above, a hay barn and a veterinary building. On the west side of Sand Creek were the livestock and horse barns. A wooden bridge located south of the existing south building was used to move the livestock to and from the pasture on the west side of the creek. Water for the Newton facility was supplied by a line extending from the Santa Fe stock yards and first appears on maps in the early 1900s. Workers Warren Boese (left) and Ted Reimer work in 1954 at the only carbonating plant on the Santa Fe system at the time, where Coca Cola, ginger ale and dry soda were bottled daily. During the 1920s, the Newton operation of the Fred Harvey system served an area from Topeka to El Paso and to Galveston which included 17 hotels and dining rooms in four Union Stations, 30 other dining rooms and 37 lunch rooms. The Newton facility was managed by B. F. Manger, employed 150 persons and covered 500 acres of land. In 1921, a typical year, shipments totaled 60,000 gallons of milk; 20,000 gallons of cream; more than half a million pounds of poultry; almost half a million dozens of eggs; 45,000 cases of soda water; and four million pieces of laundry. Fred Harvey was a purveyor of fine foods and excellent service. In most communities, the Fred Harvey Dining Room was considered "the best place in town to eat." The same standards prevailed on dining cars and did much to maintain the reputation of the Santa Fe system for good passenger service. 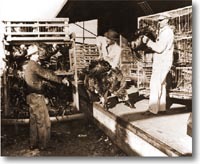 Operation of the Fred Harvey Farm was discontinued in 1960. Grover C. "Tex" Owen was the last manager in charge of the Newton operation.